In a follow-up of Hizb ut Tahrir’s meetings with the activists and political actors in the Saida region following the unfortunate events that took place in Ain Al Hilweh camp, a delegation of Hizb ut Tahrir / Wilayah of Lebanon, represented by the member of the Central Communications Committee, Eng. Bilal Zaidan; Al-Haj Hassan Nahas, a member of Hizb ut Tahrir, and a member of Hizb ut Tahrir from Ain Al-Hilweh camp, Ali Aslan, visited the former MP and leader of the Nasserite Popular Organization Dr. Osama Sa’ad, on 28/8/2017. During the meeting, the unfortunate events at Ain Al-Hilweh were discussed, that they only serve the interests of those who want to ruin one of the largest camps in the diaspora, and serves only regional and international agendas under the pretext of the so-called war on ‘terrorism’. 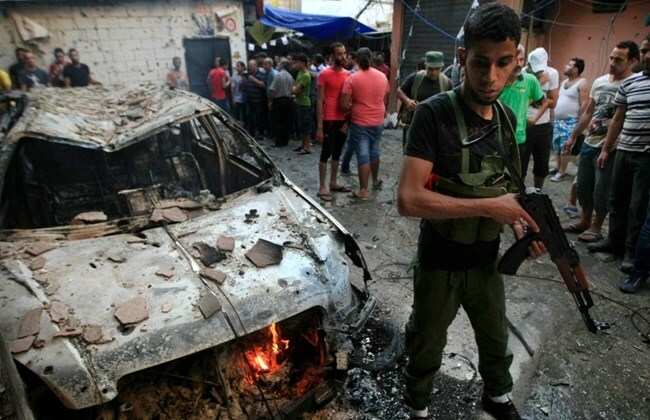 The meeting concluded by holding the Lebanese government responsible for what was taking place in Ain Al-Hilweh, and that these areas are within the framework of its responsibilities as the state, and to highlight that the Lebanese political parties must lift their hands from the quarrels inside the camp by not supporting the fighting parties. And it held the Palestinian factions responsible for controlling the parties in the Palestinian camps and to stop them from the factional infighting. And all of these parties should work on the political, humanitarian and economic care of the camp of Ain Al-Hilweh and the other Palestinian camps, and not restricting the matter to security, which generates only serious consequences for the camp and its people, and drives them towards raising the slogan of migration to escape this deplorable reality, as well as to engage in what does not represent Islam and its view; to stop the bloodshed and the adoption of the interests of the people. The meeting stressed that the walls and gates around Ain Al-Hilweh Camp do not serve as the real solutions for up to 100,000 residents, but complicates the situation, and also leads to reactions under fabricated pretexts and the silence on such actions of all political parties! The situation in the region was reviewed in general and the repercussions of what happened in Syria, and the entry of America on the line of conflict clearly to serve its interests and the formation of areas of influence at the expense of the region and its people. Additionally, it is time for this region to take its leading role in the world so as not to be areas of influence of the West, headed by America and its followers and agents in the region. Next PostEnough of a Spineless Leadership that Allies and Seeks Honor with the United States!